Karl Steinkamp, Dalat International’s Head of School is joined by Xuan You, director of global programs andservices for the non-profit, The Virtual High School. half of our high-school students will be taking online courses as part of their schedule. To achieve this goal, we use several online course providers, with the Virtual High School (VHS) being the most popular among students who are choosing elective courses. Our partnership with the VHS is an example of successfully incorporating online learning into our school. Of the 16 students who took VHS courses in the 2016–17 school year, 15 earned final grades above 90 while the other one achieved an 87. This is the highest overall student grade point average among all the international schools that enroll students in VHS courses. For those who are considering leveraging online learning to enhance your school’s curriculum and offerings, here are four tips to setting up a successful online learning component. Those who make an investment in online learning will see positive returns for the school and for students. 1. Invest in increasing the options for your students. One of our school’s primary tenets is “using technology to foster the best learning environment possible.” Through VHS and our other online course providers, we’re able to offer over 300 course options to our students—everything from climate science to digital citizenship and meteorology, as well as languages not typically taught in today’s classrooms (e.g., Portuguese and Russian). By partnering with VHS and others, we’ve been able to enhance our course catalog significantly and help students gain knowledge in areas they wouldn’t otherwise be able to access. This saves us the cost and effort of hiring teachers for only a small group of students, and it makes it possible for us to provide many Advanced Placement (AP) courses that we previously were not able to offer. 2. Understand that the skills needed to be successful online may not come naturally. For most students, a traditional school provides many of the constructs needed to be successful. The constant presence of the teacher, positive peer pressure, daily meeting times, and so on, all help students engage in courses at a level necessary to be successful. With online learning, however, some of these constructs are missing—and so the student needs to have self discipline and the intrinsic motivation to be more independent in order to be successful. Some students have these traits naturally, but others do not. When we first started offering online courses, we found that a significant number of students struggled with this new learning environment. We realized that the problem lay in students’ lack of organization, prioritization, and self monitoring skills, which resulted in them falling behind in their online studies and then giving up. 3. Provide a transitional model for students who need to adjust to online learning. To give students the support they needed until they truly became independent learners, we set up and staffed an e-lab. 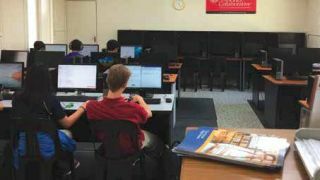 Students went to the e-lab regularly to take their online courses. If students encountered any problems, they could obtain support quickly from an e-lab staff member. When the e-lab staff saw a potential problem brewing, they could also work as liaisons between online teachers, students, and parents. This model helps provide structure to students who are not self-directed at the start, and it vastly improves student performance right from the beginning and throughout the semester. 4. Invest in the staffing needed to make online learning successful at your school. Personalized learning potential for your students. In life, you cannot always be sure that an investment is going to pay off in the long run. That said, an investment in developing an online learning environment at your school is one that is guaranteed to provide dividends both now and in the future.